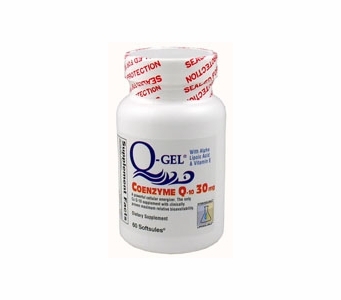 Q-Gel® Forte contains 30mg of Hydrosoluble™ Coenzyme Q10. Q-Gel® provides several times higher CoQ10 plasma levels than conventional dosage forms and achieves therapeutic levels of CoQ10 in a matter of weeks. It has undergone clinical scrutiny in humans and is the preferred dosage form of Coenzyme Q10 recommended by many physicians and cardiologists. Most notably, since Q-Gel® Coenzyme Q10 is formulated via the patented Bio-Solv® technology, it’s absorption is not dependent on the food you eat and it provides effective serum levels at lower dosages. You take less… Q-Gel® CoQ10 does more! Patented Biosolv™ process has created the first hydrosoluble Alpha-Lipoic Acid for fast, complete absorption. This helps Lipo-Gel Alpha-Lipoic Acid serve as a SUPER ANTIOXIDANT to enhance the potency and life of both vitamins C and E. Lipoic acid is a key factor in the conversion of carbohydrates to energy. Free of: Milk & milk by-products, egg & egg by-products, fish, shellfish, tree nuts, peanuts/oil, wheat, starch and yeast. Q-Gel®, Softsules® and CoQPure® (logo) are registered trademarks of Tishcon Corp.
Duosoluble™, Hydrosoluble™, and Liposoluble™ are trademarks of Tishcon Corp. Manufactured under one or more of the following U.S. Patents: 6,056,971 and 6,300,377. Other Patents pending.